For the first time ever, Marvel characters appeared in a Walt Disney World theme park as part of the one night event, Villains Unleashed. 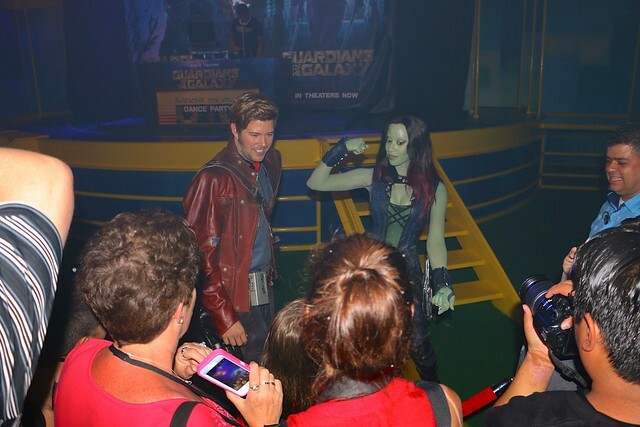 At the Awesome Mix Tape Dance Party, “Guardians of the Galaxy” characters Star-Lord and Gamora mingled with guests of the special after-hours event. There was no formal line formed to meet the duo. Instead, they simply paced back and forth behind velvet ropes, interacting with fans and taking plenty of pictures. 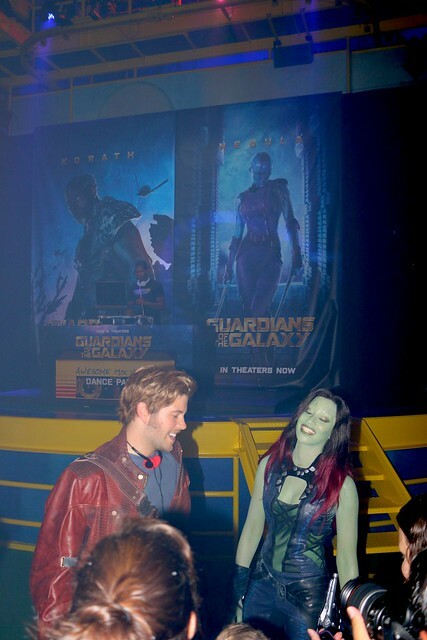 This Star-Lord didn’t exactly look like Chris Pratt (tough to face match one of Hollywood’s hottest stars for a theme park gig) but the Gamora character did often closely resemble Zoe Saldana, in the right pose. Their casual appearance was a welcome change from the long lines that plagued most of the other popular characters throughout the evening. 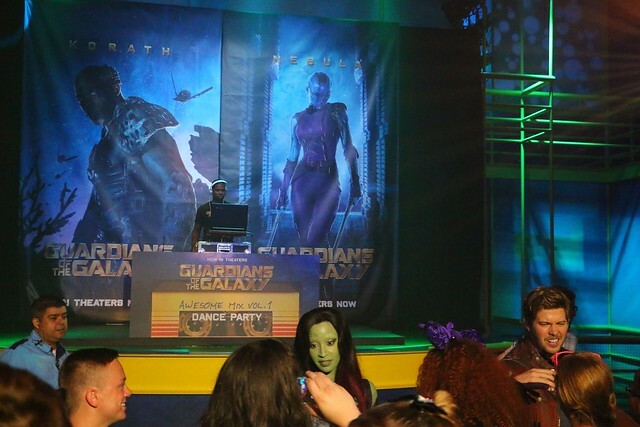 While Constantine from “Muppets Most Wanted” and the live action Angelina Jolie-style Maleficent characters drew wait times of more than 3 hours, anyone could easily walk into the “Guardians” dance party (held inside the Disney Junior area of the park) and hang out with the intergalactic outlaws. Their appearance marks a big milestone for Disney. Though Captain America and Thor have already appeared at Disneyland and Spider-Man has swung in to Disneyland Paris, this is the first time Marvel characters have made their way into a Florida theme park – or, at least, a Disney-owned one. Marvel characters have been appearing at Universal Orlando’s competing theme park, Islands of Adventure, for many years. A contract pre-dating Disney’s Marvel purchase states that Universal has exclusive theme park rights to use a certain set of characters, not only in meet-and-greets but also attractions. But since Universal never used the “Guardians of the Galaxy” characters (after all, who had really ever heard of them before the recent hit movie? ), Disney is free to do what they wish with them throughout Walt Disney World. Likewise, Disney’s next big animated movie is “Big Hero 6,” based on a Marvel comic series. Since it features another set of obscure Marvel characters that Universal never used, Walt Disney World will soon offer meet-and-greets with Baymax and Hiro, the film’s stars. 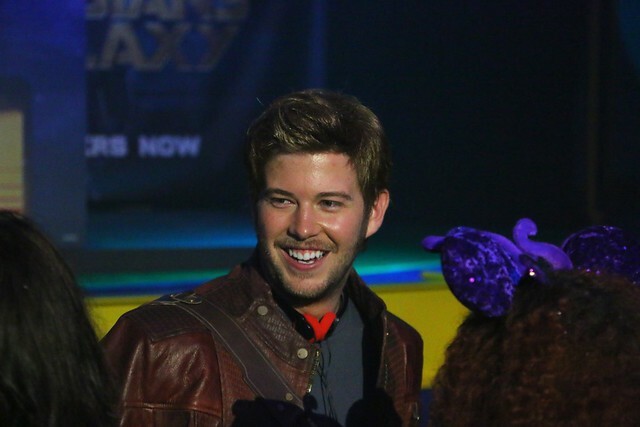 As to why two good guys from “Guardians of the Galaxy” first appeared at a villains-themed event, Disney says they were there to recover Peter Quill’s Awesome Mix Tape, which apparently was stolen by the bad guys. But really, they were just there to be awesome. Universal never “used” Thor either, so why’s he exiled to Disneyland? You need to read the Marvel contract. It covers characters used in Islands of Adventure (Spiderman, Hulk, X-Men, Captain America) and any characters that would be in their “family” of characters…which means the Avengers can’t be used by Disney in Florida or Japan because Universal has used some of the Avengers characters (which makes the others out of bounds for Disney). Because Thor is an Avenger and is part of the same “family” as Hulk and Captain America and others, then Disney can’t use Thor in Florida’s parks and they can’t use anything that is labeled “Marvel”. So Disney is being smart and developing things like Guardians without using the Marvel name on it. 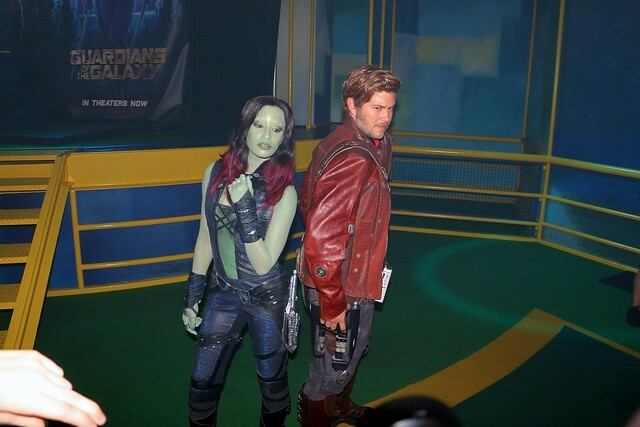 I think Guardians will end up in Tomorrowland at some point. Uh, might want to check the final-release poster, the M-word’s pretty clearly there. Here, think it’s more a case that the two WERE just here to Be Awesome, and not make “official” M&G’s…Which is what Universal warns against. I love the Villains event, and I am glad to see it is a hard target event. I know that I was there last year (9/13/13) and it was not a hard ticket event and was terrible as it was overcrowded, unorganized, but still had some neat things. Hard ticket event is awesome. I was excited to see that the newest Marvel characters made an appearance. I am more than sure Disney knows what they are doing, and hope they find a way to get us more in the FL with their Marvel property. But since I ma not a lawyer, and will not clam to be one after reading some documents found by Google, or Wikipedia.